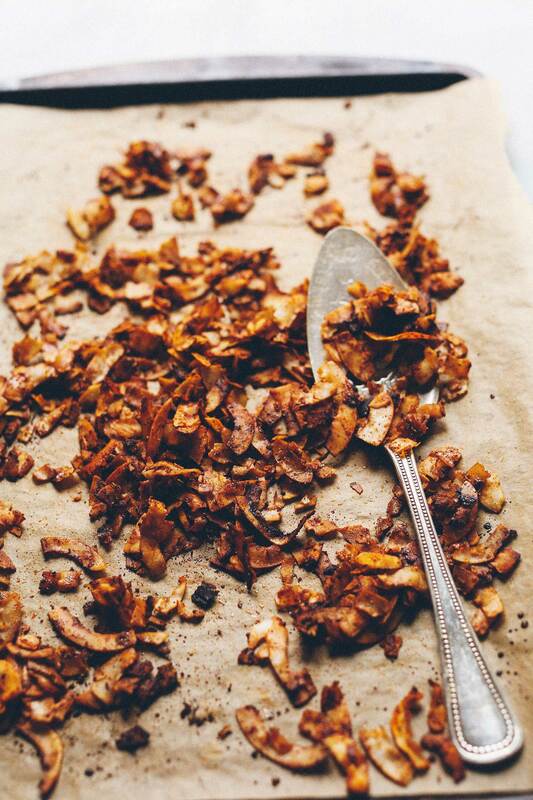 If you’ve ever craved bacon but didn’t want the real thing, coconut bacon is the answer! This recipe is simple, requiring just 8 ingredients, 1 pan, and 15 minutes to prepare. 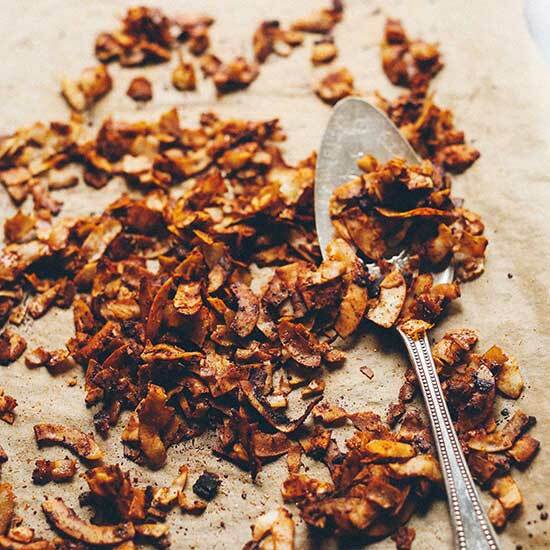 The result is crispy, bacon-flavored coconut flakes that are perfect for adding to things like salads, sandwiches, dips, and more! We hope you love this recipe! If you try it, be sure to tag a photo #minimalistbaker on Instagram, and leave a comment and rating! Thanks for supporting Minimalist Baker! 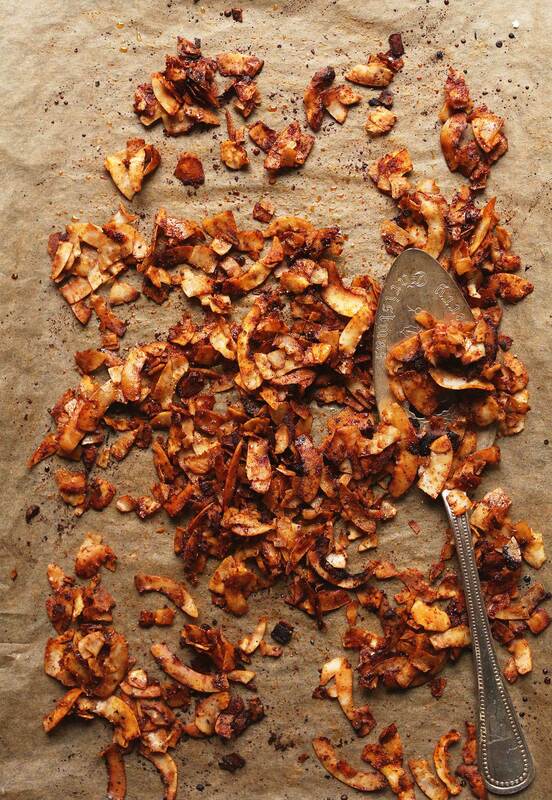 Savory, crispy coconut bacon made on 1 pan in 15 minutes! Perfect for topping salads, adding to sandwiches (hello vegan BLT), dips, and more! Preheat oven to 325 degrees F (162 C) and line a baking sheet with parchment paper (or more baking sheets if increasing batch size). Add coconut flake, oil, tamari, paprika, maple syrup, liquid smoke, sea salt, and black pepper. Toss/stir to thoroughly coat. Bake at 325 for 6 minutes, then stir and flip pan around. Bake for another 5-7 minutes, or until coconut bacon is crispy and golden brown. Watch carefully in the last minutes of cooking and be careful not to burn as it can go from brown to burnt very quickly. Let cool for 10 minutes - it will continue crisping as it cools. Coconut bacon is great for adding to things like salads, sandwiches, dips, and more! Store leftovers covered at room temperature up to 1 week (sometimes more), or in the freezer for 1 month. *As the name suggests, liquid smoke adds a hint of smokiness to this recipe. I wouldn't consider it an essential ingredient, but it does help provide that "bacon-y flavor" and I would highly recommend trying to get your hands on some! It can be found at most grocery stores and online. *Recipe loosely adapted from Cookie and Kate. I love this recipe! I love the flavor of bacon, but don’t really care for bacon itself so this is perfect! I like to top salads and mac and cheese with it. Super easy and super delicious! I store mine in a glass peanut butter jar and it lasts a few months. Once I didn’t close the lid well and it did get soggy within a couple days. I have shared this recipe dozens of times! It is always a hit, and I love adding it to salads. Thanks for the awesome recipe! We live in Hawaii and harvest our own fresh coconuts. I cut the coconut in micro thin slices with a vegetable peeler. The ratios of ingredients was perfect. I had to bake it a little longer because the coconut was fresh, but it turned out delicious! My husband even loves it! So delicious!! I did not have liquid smoke but had lapsang souchong tea (which is a smoked tea) and ground it up and used equal amount of tea as called for liquid smoke. I also added 1 teaspoon of maple syrup and am enjoying it on my salad with Ras el Hanout spiced dressing! Thank you! This coconut bacon is so good!! I made a batch this morning to have on avocado toast. My daughter was eating right off the pan! My only change was that I cooked it on a cast iron skillet in the oven because I didn’t have parchment paper. Amazing how it gets crunchier as it cools! So easy and SO delicious!!! Yay! Glad to hear it, Jet! I have a question, can you use dried coconut flkes of has it to be fresh one’s? Hi Gaby! We had most success with large flake unsweetened coconut, but if you experiment then let us know how it goes! Isn’t liquid smoke a carcinogen? Not exactly good for you. I can’t believe how good this recipe is! It tastes exactly like bacon!!!!! I’m so happy I found this! This (well, the brussel slaw but this is the highlight) has entered my routine meal rotation! I also love to roast my squash seeds and was getting bored of the same old garlic salt/pepper/olive oil so I spiced a batch up like these and am devouring them! I just made this tonight . I loved it. My husband is in love with it. I will definitely make it again. I love The Minimalist Baker, thank you! Are you able to replace the maple syrup with anything else? I’ve been wanting to try coconut bacon for a while now, and tonight I gave it a whirl. I was kind of surprised at how good it was and really didn’t taste much like coconut at all! I used Bragg’s liquid aminos because I was all out of Tamari and I think it actually gave it even more of a smoky bacon flavor. So easy to make, I can’t wait to try these sprinkled on a vegan Caesar salad. I made this last night to have in today’s salad and after the first taste, could barely keep myself from simply eating it by the spoonful by itself! It’s that wonderful. I thought of it all night and can’t wait to have it for lunch. Thanks so much! I doubled the recipe and next time wouldn’t double the liquid smoke–maybe just half again as much. I use Bragg’s Amino Acids in place of tamari. Pinch of salt here really means pinch, not more–I’ve had it come out too salty and depending on the saltiness level of your tamari/soy/Bragg’s you might skip the salt entirely at first and taste. Going to try this tonight with the brussels sprouts slaw. Question – can you use soy sauce instead of tamari? Hi! I have everything needed for this recipe except the coconutflakes, because I can only find pre- toasted ones. Would they work? Hi! We haven’t tried it, but it should work! Let us know how it goes! This is so great to have!! Hey Minimalist!! !–you lead the way out!!!! This is legit. It’s very good. Very close to actual crispy bacon, which I haven’t had in years. Try it, you’ll like it. Hi Cathy! You can freeze aquafaba! Using an ice cube tray or other measured container is a good way to use easy pre-defined amounts. … A few days shouldn’t be a problem in anyone’s fridge, but if you plan on keeping it more than a week or two, you’re probably better off freezing it. This is incredible! I left out the liquid smoke as I didn’t have any on hand & also subbed coconut aminos for the tamari. It worked perfectly! Thank you, Dana! Is there any way to keep this crunchy? We’re at 24 hours and it’s super floopy. 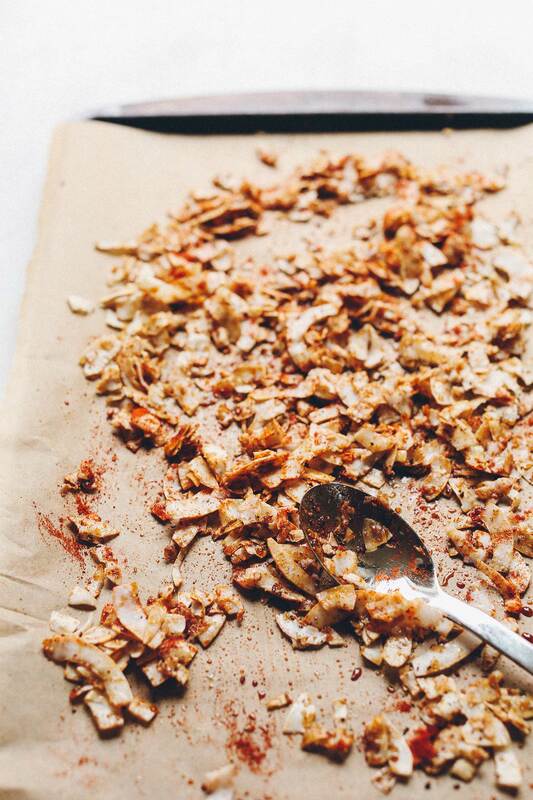 Do you think I could try using coconut shreds instead of coconut flakes? Loved it! You’re probably not fooling anyone into thinking it’s porky bacon, but then again, that’s not the point. For me it’s about finding healthy, easy options that deliver the same qualities (crunch, smokiness and salty flavour) without the need to breed and kill an animal for it. And with this I did just that! The coconut flavor is pretty THERE if you know what I mean, but that’s fine by me, being a coconut on everything type of gal! Will try adding this to creamed kale – yum?!?!?!?!? I added a ton of black pepper and extra smoked paprika because I didn’t have any liquid smoke on hand. It came out wonderfully. Sampled it in a “BLT” and it was great! I wasn’t looking for a bacon replacement per se, but I do like the crunchy, smokey and salty that bacon adds and I was looking for something like that. I was able to whip this recipe up in the time it took to preheat the oven. I cooked it exactly as instructed, 6 minutes, stir, 5 minutes (check on it) then added 2 more minutes. I took it out at that point because I was cooking other things and didn’t want it to burn, plus the recipe said it would crisp up and it did. It was really tasty! I would probably reduce or leave out the maple syrup because I found it made the bacon too sweet for me but only because my preference for crunchy, smokey and salty bits is more savory. I think the liquid smoke is a must add and I might add just a tiny dash more but just a dash. Don’t omit the pinch of salt, even with the tamari, it’s really needed. Overall, I think this is pretty darn good and I would make it again. Love your recipes! This is perfection! I will always have liquid smoke in my cupboards. I have given this to non-vegan friends who are equally impressed by it’s delicious taste. Thanks for this recipe. AMAZING! Coconut is such a great base because it’s a fatty fruit and it helps give this a familiar texture. The flavor is on point. I’ve been making this for a few weeks and throwing it in pita with avocado and mustard, using as a topping for salads and pancakes, and just eating it straight out of the jar. Unbelievably good and satisfying. I have made this a staple in our Eat to Live diet and both the kids and I never get tired of these chips! Anytime we crave our old friends “Chip” and “Dorito” we can get the edge off by having a little bowlful of these guys. In Hawaii, we love Spam (so hard for many to believe!) So I used this marinade to make a tofu “spam” that even my die hard carnivorous husband likes! Elisa, how do you prepare the tofu spam? I’m also in Hawaii. I did attempt it once, but is was just meh. I’m very allergic to Maple, can I use brown sugar in place of? I used brown sugar and it came out very good. I am making this NOW! I too was without liquid smoke and tamari so I improvised. I played with regular soy sauce and Worcestershire sauce. And I had to use 1/2 smoked paprika and 1/2 hot smoked paprika, because I ran out of the first. I use it a lot in recipes! I agree with paying attention as your timing was spot on. I thought it needed more time, but took it out and kept stirring it as it browned up perfect. I do not miss bacon at all, and wanted this because I love coconut, and adding the depth of smoky sweet spicy was what I wanted. Going to put this right into your 7 layer salad recipe, and use your tahini lemon dressing that I love also! Thank you for your unique and delicious recipes!! Hi Sarah! Any Tamari sauce will do! Thank you for your quick reply. Also, will regular size coconut flakes work with this recipe or will they burn? Just started to make this but 2 generous cups of coconut flakes only is 111 g on my scale and 160 is about 3 c. Which should i lean to c or g? I’d lean toward the grams! Dana, I’ve never had bacon, but this is delicious. Thanks for another winner! Oh… my… goooooooodness! This is so yummy! I made it without any sweetener because I can’t have it in my diet, and it was smoky salty HEAVEN!!! I don’t know if I will have any left for our salad and soup tonight! So interesting…. and yummy! Been vegetarian my whole life, so I have nothing to compare this to. But, hey, yum-my! Thanks for the recipe. WOW awesome recipe! I did the coconut recipe and liked it so much I sliced a package of tempeh and marinated it in the same sauce…awesome! Thanks so much for this recipe! I left out the liquid smoke as I didn’t have any…added 1 tsp of sweet smoked paprika and 1/2 tsp of hot smoked paprika and a tsp more tamari and baked a bit longer. Delicious! Can you tell me what is smoked liquid? I have never heard of this? can I replace this with something else or just omit? It’s essentially smoky flavor condensed into a bottle. Rather than taking the hours to infuse foods in a smoker, the smoky flavor is right there in the bottle. At my supermarket it’s usually near the Worcestershire and BBQ sauces. Without liquid smoke I imagine this would still be good but would not be nearly as bacon-y! Hi! While the liquid smoke is what really gives this coconut bacon its flavor, you can make it without if you prefer. Good luck! Could I use Coconut Aminoes if I don’t do soy in place of the Tamari? Really want to make this. Hi! I haven’t tried using it for this recipe but that should work! If you give it a try, report back on how it goes! Good luck! Looks AMAZING! question – where do you find your large flake coconut? Hi! Trader Joe’s is my go-to, but you should be able to find it at your local grocery store! I found coconut chips on thrivemarket.com, too! It looks similar to what the picture above shows. Just in case you are not near a TJ’s, like me! They are Thrive Market brand and cost $5.95 for a 16oz. bag. This sounds intriguing! I wonder if you can tell me how much of the coconut flavor prevails in this recipe? I find many vegan substitutes that have a coconut base retain much of the flavor. Unfortunately, I am not a fan of that flavor. Thank you for all of the great recipes. I would say the coconut flavor left behind is minimal but certainly not non-existent. Perhaps make a half batch and try it before you commit! Bacon. My gateway drug to being an omnivore. We go wayyyyy back. I grew up on hog farm and it was a staple at breakfast and sometimes lunch and dinner. Years went by, I grew up and moved out of the house and converted to vegetarianism…..and I was a terrible vegetarian. I knew nothing about proper nutrition, was not getting enough protein and gave it up. Let’s fast forward to now. I am still an omnivore looking to consume far less meat than I do now. I saw this little number show up on my FB feed and decided to give it a try. It is very, very good. Smoky, salty with a hint of sweetness. I substituted with canola oil because I did not have grape seed or avocado oil. As I type, my carnivore worshiping boyfriend is out in the kitchen snacking on it. Thanks for sharing this recipe. It’s a keeper.